A good mys­tery may keep me up late at night as I fol­low an excit­ing sto­ry and try to uncov­er clues that lead me to who-dun-it before the sleuth. If I’m sur­prised, that’s an added ben­e­fit. Nail-bit­ing? You bet. Fear for the safe­ty of a total­ly imag­i­nary hero or hero­ine? Oh, way sure! But laugh all the way through until tears flow? Some­times that’s exact­ly what I’m look­ing for. And two of my favorite series fit the bill. Tamar Myers is one author. Her Penn­syl­va­nia Dutch Mys­ter­ies (with recipes, even) fol­low Mag­dale­na Yoder as she solves mys­ter­ies while run­ning her own Pen­nDutch Inn. Some books in the series were pub­lished twen­ty years ago, and oth­ers more recent­ly. One review­er of Too Many Crooks Spoil The Broth said, “Part Agatha Christie, part Key­stone Kops, with a few tan­ta­liz­ing food stops along the way.” Some titles are: Play It Again, Spam, The Crepes of Wrath, and Custard’s Last Stand. True sto­ry: She sold each book on the title alone! Okay, maybe not the first one. 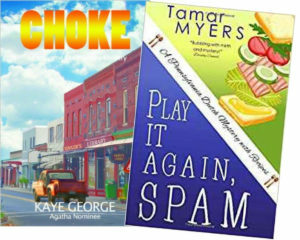 Kaye George is anoth­er author who fits the bill. Choke, Broke, and Smoke, are the titles in her Imo­gene Duck­wor­thy Mys­ter­ies. One review­er said: “Ques­tion: If you com­bined Lucille Ball with Inspec­tor Clouse­au, what would you get? Answer: Imo­gene Duck­wor­thy, ama­teur PI…” Immy, the ama­teur sleuth who real­ly wants to be a pro­fes­sion­al, is one of a kind. She tries her darn­d­est, while the read­er won­ders how she can pos­si­bly suc­ceed, but cheers her every effort any­way. I could add, the read­er also enjoys her unex­pect­ed detours from those detect­ing chores. Both authors have oth­er series as well, series I great­ly enjoy, maybe not just when I’m in a sil­ly mood. Do you have a favorite fun­ny mys­tery or series? I’d love to add to add to my, ahem, over­whelm­ing pile of BTR (books to read). I love their oth­er books too!